What do they know of dogs who don’t know this? Dog lovers, each one of them, have their own favourite something or the other with their pet. But can anything come close to a fullbodied hug from a dog larger than you while on two feet? 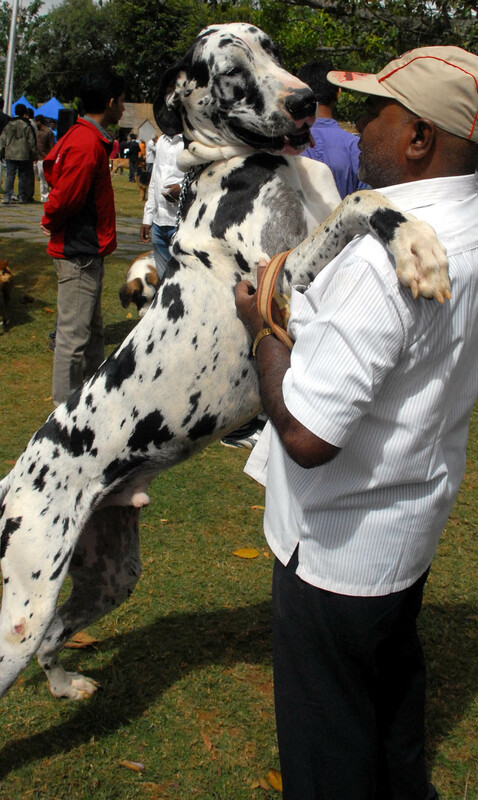 At a show organised by the Bangalore canine club at the palace grounds in Bangalore on Saturday, a trainer gets a demonstration. This entry was posted in Life Etcetera, Mysore-Bangalore and tagged Churumuri, Karnataka Photo News, KPN, Sans Serif, Tony. Bookmark the permalink. ← Forget Congress, what about the state of BJP? they’ll hug you, make you giggle uncontrolabbly, make you happy even if you are a dog-hater, till you die. Even if a thief breaks in to our humble house, my lab and golden will slobber him with licks and kisses. Big dumb lovable creatures. Takes a lot of effort keeping up with these two beasts, but worth every second of my time, we are repaid 100x more in love. dogs are far superior than humans.